Simuwu Ding (sī mǔ wù dǐng 司母戊鼎) is the most famous square-shaped ding. 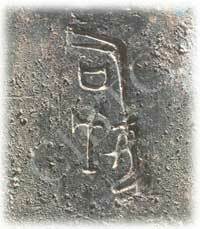 It was found on March 19, 1939, in Anyang (ān yáng 安阳) of Henan (hé nán 河南) Province. 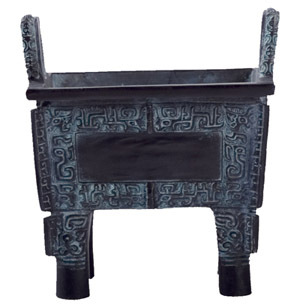 It is the largest existing bronze ware in the world. And it is housed in the Chinese Historical Museum (zhōng guó lì shǐ bó wù guǎn 中国历史博物馆) in Beijing. Simuwu Ding was cast by Emperor of the Shang Dynasty as a ritual object for a ceremony to offer sacrifices to his mother. And it was so called because there are three characters “司母戊 (sī mǔ wù)” on the inside of the sidewall. According to archeologists, “司 (sī)" means sacrificial ceremony and “母戊 (mǔ wù)” is the name of the emperor’s mother. Simuwu Ding is 133cm high, 110cm long and 78cm wide, weighing 875 kilograms. It is solid in build, magnificent in appearance and was made with fine craftsmanship. There are various motifs on its body, exquisite and clear, symbolic of the power of nature. 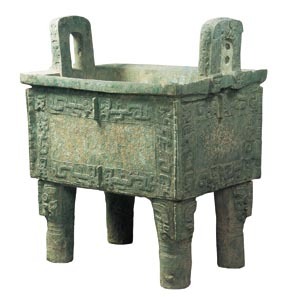 Simuwu Ding represents the highest level of bronze cast technology in the Shang and Zhou dynasties. Buy a book to learn more about China's cultural relics.